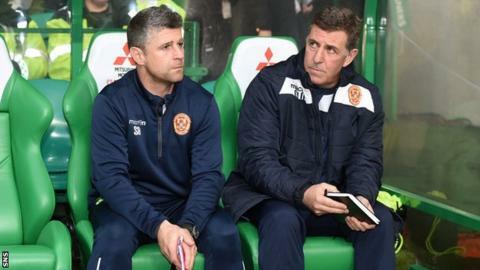 Motherwell assistant manager Stephen Robinson has extended his contract at Fir Park until May 2017. The 41-year-old had joined the club in February 2015 when Ian Baraclough was manager but remained once Mark McGhee succeeded him in October. McGhee told his club website: "Stephen is an excellent assistant and an excellent coach. "It became clear to me very quickly when I joined the club that we had someone of real talent and integrity." Northern Irishman Robinson, the former Bournemouth and Tottenham Hotspur midfielder, is also on the coaching set-up with his national team and will be with them at the Euro 2016 finals in France this summer. "He's very well respected in the game," said McGhee. Robinson had helped Baraclough's side retain their place in the Scottish Premiership after defeating Rangers in last season's play-off final. However, after a poor start to the present season, the Englishman was replaced and Well have gone on to secure a top-six finish this season under McGhee. Robinson said he was delighted to extend his contract to coincide with the Scots'. "I've really enjoyed my time at Fir Park," he added. "There have been some challenges, but it's a pleasure to work for the club and the people around the place have been brilliant. "We changed the manager back in the autumn and that always brings some uncertainty, but I cannot speak highly enough of Mark and we enjoy a very good relationship. "On the park, making the top-six has been an excellent achievement."